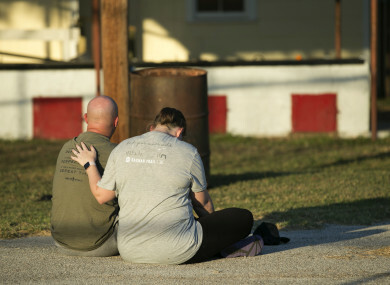 THE COMMUNITY OF Sutherland Springs in south Texas comprises between 400 and 600 people. The town’s First Baptist Church holds its Sunday service at 11am, which is usually attended by about 5o people. Twenty minutes after it got under way yesterday morning, a young man dressed in black and wearing a ballistic vest walked into the small, white building. Devin Patrick Kelley, a 26-year-old former member of the US Air Force, opened fire with an assault rifle. He shot 46 people, killing 26 of them and wounding another 20. Among the dead were children, pregnant women and the elderly. The youngest was five years old; the eldest 72. Twenty-three of the victims were found inside the church, while two were pronounced dead outside the building. A 26th died while being transported to hospital. Of the injured, some are said to be in a critical condition raising fears the death toll could increase. The rural community registered a population of 362 in 2000, according to the Handbook of Texas. It is thought that number has risen in recent years but Sutherland Springs remains a very small rural community about 50 kilometres southeast of San Antonio. Department of Public Safety regional director Freeman Martin told reporters last night how one of those residents “engaged” the gunman after he had exited the church. “A local resident grabbed his rifle and engaged that suspect,” he explained. The suspect dropped his rifle – which was a Ruger AR assault-type rifle – and fled the church. A number of other weapons were found in his vehicle which he crashed off the road near the border between Wilson and Guadalupe counties. The as-yet anonymous neighbour was not injured in the pursuit. In a brief statement, the Pentagon confirmed Kelley previously served as an airman “at one point”. Later, an Air Force spokeswoman Ann Stefanek detailed how he was court-martialed in 2012 for an assault on his wife and child. He received a bad conduct discharge, 12 months’ confinement and a reduction in rank. He was discharged in 2014. No information about any perceived motive has been released this early in the investigation. A number of law enforcement personnel were seen at his listed address in a wooded area on the rural, western outskirts of New Braunfels, north of San Antonio last night. His neighbours in that area – which is around 35 miles from the Sutherland Springs church – have said that they heard intense gunfire from that direction in recent days. Authorities were also slow to begin identifying victims, but in such a small community, names were being released locally almost immediately. Among the first named was the 14-year-old daughter of the church’s pastor Frank Pomeroy. He described Annabelle Renee as a “very beautiful, special child”. He was not in the church at the time as he had been driving back from the nearby state of Oklahoma. About 100 of the tiny population gathered around the church last night for a prayer vigil, lighting candles and shedding tears for their family members, friends and neighbours. “We’re coming together to pray for them and show the world that now, in the midst of darkness, there is light,” said local man Mike Gonzales. “The people of this church are wonderful people,” he added. “This act of evil occurred as the victims and their families were in their place of worship. Our hearts are broken,” US President Donald Trump said while on a visit to Japan in the aftermath of the shooting. Later, Trump distanced the incident from America’s gun laws. “We have a lot of mental health problems in our country, but this isn’t a gun situation,” he said. Speaking at last night’s press conference, Texas Governor Greg Abbott thanked the president for his support. He also made an emotional plea for Texans to show love to their family members at this tragic time. “We are dealing with the largest mass shooting in our state’s history,” he confirmed, warning the figure of 26 could climb higher. There’s so many families who have lost family members. Fathers, mothers, sons and daughters. Email “Local resident 'engaged suspect in gun fire' after worst mass shooting in Texas history”. Feedback on “Local resident 'engaged suspect in gun fire' after worst mass shooting in Texas history”.